When I first saw the 2008 academy awarding winning motion picture “Slumdog Millionaire”, I was completely blown away by it. I couldn't get enough of the film, I had to encourage all my friends to see it and I even referred to it as “One of the most perfectly constructed movies I’ve ever seen.” I wasn’t alone in making statements like that, audiences fell in love with this movie and it appropriately won the best picture award for 2008. However, over the past five or so years, I’m starting to look back at this film is a different way. Don’t get me wrong, my feels for the movie haven’t changed, I still think it’s an excellent flick but my attitude tower this film has changed a great deal. Yes, it’s still a great movie, but I certainly don’t think it’s perfect either. 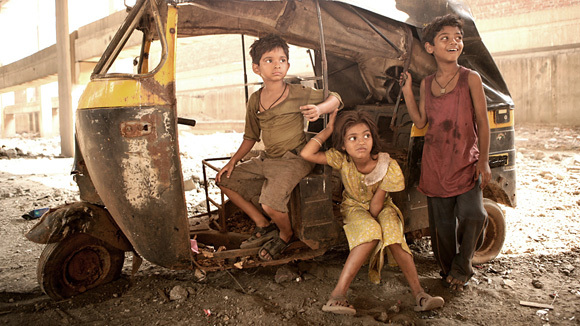 Obviously, in order to get my point across, I need to go over the plot, characters and subtext that “Slumdog Millionaire” has to offer. 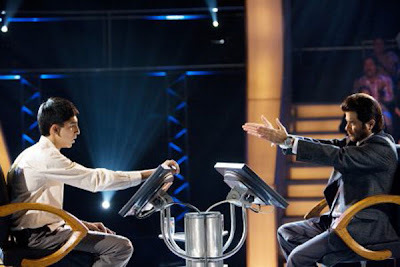 Our story takes place in India, around 2006 and a young man named Jamal is a contestant on “Who Wants to Be a Millionaire?” (the Indian version). Jamal is apparently very good at answering these complicated questions, which is surprising the audience and host because Jamal’s from the Slums and has gotten little education. It gets to the point where he’s arrested and interrogated by the police on suspicions of cheating. To prove he knows his facts, he shares his life story with the interrogators and addresses that many of the events in his life lead to his knowledge demonstrated during the game. So the film cleverly conveys that if you pay close attention to what you learn throughout your life, simple knowledge and understanding can have a significant impact on your future. 80% of this movie is told through flashbacks and its here that the film becomes the most interesting. Watching this young man’s story unravel from his child hood, to his teenage years and then to his young adult life is such an exciting experience. Most of what he lived through is very downbeat but it’s also very intriguing to see how his life moves from one situation to another and how his relationship with both his older brother and girlfriend develops over the years. Sometimes, the journey of one’s life can be more exciting than any big adventure that a first rate action star embarks on and here it’s quiet literal because Jamal’s life is a tragedy and an adventure all rolled into one. It’s a story about good things that happen to people in bad circumstances and the ending is one of the best feel good moments ever to be experienced in film. I love movies that combine and convey different tones and emotions because it’s kind of like being on a roller-coaster ride. At times this film can be upbeat and even really funny, most of the time it can be down beat and depressing but it can also be very uplifting and powerful all at once. The directing and editing style of the film is especially cool and the lighting is very stylish. The movie also ends with an especially upbeat musicale number set to the song “Jai ho”, which is fun but completely off track of the realism the movie tried to convey earlier, making this a perfect example of the movies Achilles Heel. This story is rooted 100% in the real world and every obstacle that Jamal faces or encounters have some series resolves. The scene involving the Bombay Riots is especially intense and done with a frightening sense of realism. However, the way the story is told and concludes feels more like something from a fairy tale. Let’s be honest, it’s pretty convenient that every one of these questions had some impact on his life and it’s even more ironic that every question is in a perfect order that matches with the linier story of his life. Plus, unlike most reality based drama’s, this film ends on the happily ever after note, with Jamal getting together with the love of his life and they both dance off into the sunset together. Now that’s not to say people can’t have happy lives after some series life struggles. It’s just that the way the film represents real life struggles, events and situations with absolutely no fantasy overtones makes you expect everything it to end on a series and intense note that’s more honest and true to the films dramatically realistic tone. Films like “Big Fish” and “Moulin Rouge” also have stories that follow a fairy tale formula but there set in worlds that are reality mingled with fantasy. “Slumdog Millionaire” is just an uneven clash of real life situations and fairy-tale style storytelling that can throw off many viewers. There’s also a lot of scenes that feel a little exaggerated. When Jamal is first brought to the police station on suspicions of cheating he isn’t just interrogated, no, he is tortured in some brutal and horrific ways. He’s electrocuted, punched, beaten and his head even gets dunked in a bucket full of blood for long periods. It’s not like he’s being accused of stealing or murdering someone important, he’s being brutally tortured on the small suspicions (with no clear evidence I might add) of cheating during a game show. Now I’m no expert on what the polices or procedures are like in India are or other foreign countries but this just feels manipulative and uncalled for. Now having said all of that, I do still enjoy this movie a lot and honestly, I think it’s the best movie to receive the best picture award in years. I love the characters, I love the different emotional levels the movie takes you through and even though the ending leans closer to fantasy then reality, it truly is one of the best feel good finalizes that a film can offer. If you can watch this movie without analyzing all the details and just accepting what the film has to convey, then you’ll definitely have a good time. 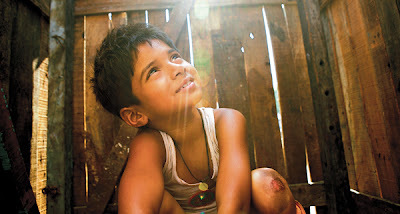 I give “Slumdog Millionaire” 4 ½ stars out of 5.